CAR-T Cell Therapy: Will First To Market Mean First To Disappoint? Gilead and Novartis have launched the first two autologous CAR-T cell therapies. Combined, their first year revenues were less than $250 million. Significant manufacturing expansion plans have been announced despite a ramp constrained by pricing and reimbursement. Despite increased risk, treatment is being shifted to out-patient settings to limit losses by containing cost. So far, the oncology community has greeted CAR T cell therapy with extraordinary enthusiasm. We've had few effective treatment options for difficult-to-treat blood cancers like diffuse large B-cell lymphoma. The newest data from ASCO continues to suggest that CAR T cell therapy may represent an important advance for some patients. 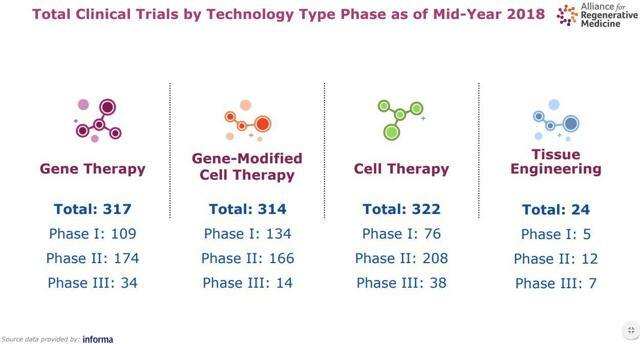 Autologous CAR-T, short for chimeric antigen receptor T-cell, therapy is being pursued by dozens of gene therapy companies. Novartis (NVS) and Kite, a Gilead (GILD) company, were the first to market in late 2017 launching Kymriah and Yescarta, respectively. Now, a year later, the question to ask is will the first to market become the first to disappoint? My first article entitled Genomic Medicine: Catch the Gene Therapy Wave is a primer providing context for this article. Both companies have led off their commercialization efforts with a focus on treatment center coverage and manufacturing capacity. As of September 30, 2018, there were 63 cancer centers for Kymriah and 64 for Yescarta. 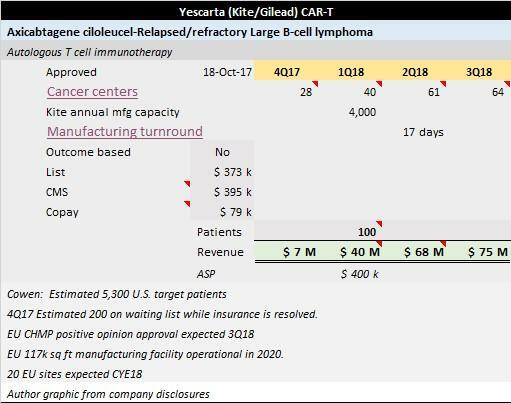 Yescarta for refractory large B-cell lymphoma has a manufacturing turnaround of 17 days. They estimated their El Segunda, CA factory would have annual capacity of 4,000 to 5,000. This year, Gilead announced plans to build an EU CAR-T manufacturing facility along with expansion plans in the US. 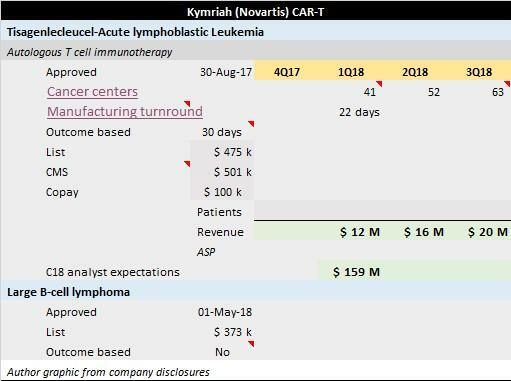 Kymriah for acute lymphoblastic leukemia has a manufacturing turnaround of 22 days. Novartis has announced plans to build EU capacity in Germany and Switzerland. They have also signed a deal to manufacture in China. Novartis reported the first manufacturing batch control mistake which led to a fatal relapse. The research, clinical and commercialization expenses were substantial. Add in the investment required to build manufacturing and treatment capacity, and it appears obvious that costs are dwarfing the minimal revenues achieved since launch. 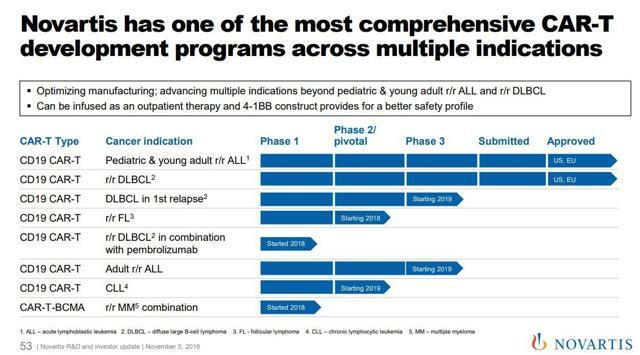 That said, the Novartis pipeline indicates they are "all-in" on CAR-T. These medicines are not pills being manufactured by the millions with increasing economies of scale. These are expensive medicines that have been called "living drugs". The autologous process requires harvesting a patient's T cells in a process called apheresis. 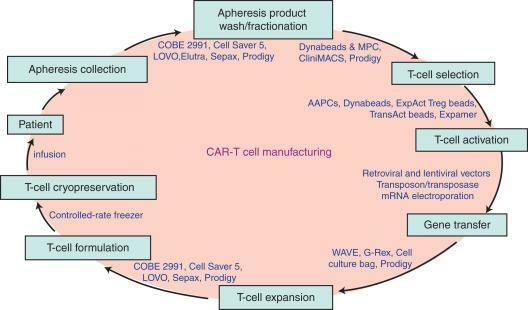 These T cells are engineered to produce CARs on their surface, becoming CAR-T cells. In two to three weeks, the cells have been multiplied in a lab and are ready to be infused back into the patient to seek out, recognize and kill cancer cells. This process can be seen in the above graphic. How much is financial loss stopping centers from adopting Yescarta? CAR-T has been commercially launched in an era of escalating price concerns. Price gouging has been added to the lexicon of the pharmaceuticals industry from the EpiPen pricing from Mylan (NASDAQ:MYL) to the antics of Martin Shkreli. Politicians are successfully using price control sound bites to generate support. Despite the desperate need of patients and the clinical evidence of efficacy, these treatments are too expensive to be priced low enough to escape public attention. Gene and cell therapies also present an insurance coverage dilemma. One of the cornerstones of reimbursement is a determination of cost effectiveness. These are cutting edge medicines that cannot today prove durability which is an essential input variable in this equation. The lack of US single-payers creates insurer concerns that future treatment savings could accrue elsewhere if a patient changes to another provider. Inpatient Payment: The current FY 2019 national Inpatient PPS payment rate for MS-DRG 016, into which CAR-T cases are grouped, is approximately $39,000. For providers subject to IPPS, the payment may be augmented by the full New Technology Add-on Payment or NTAP, and they may potentially also receive an outlier payment. The total payment providers are likely to receive will still leave the vast majority of inpatient CAR-T cases as substantially under-paid, given the high product acquisition cost. New Technology Add-on Payment: While helpful to supplement a relatively low base payment rate, the NTAP mechanism is problematic in several ways for drugs acquired at a high cost, such as CAR-T. In the case of CART, the maximum amount a center could receive for an NTAP payment is $186,500. This amount is a significant improvement over the MS-DRG 016 base payment of $39,000, but it is still $186,500 short of the acquisition cost that each provider is currently paying the manufacturers in order to deliver the intervention to a patient in need. Access to Care Implications and Analysis: The financial losses associated with providing CAR-T treatment to Medicare beneficiaries is impacting access to care and will continue to do so unless the payment challenges are resolved. Members have shared that their teams have felt compelled to consider one or more of the following treatment pathway modifications, due to the current payment systems: 1) Shifting some CAR-T therapy to the outpatient setting to recover product acquisition costs. 2) Choosing not to participate in the clinical studies associated with a Coverage with Evidence Development. 3) Electing not to provide commercial CAR-T products to any portion of their patient population. A major concern of this therapy is its cost, which some estimates predict could go over $1 million per patient. Please talk about the cost vs value of CAR T-cell therapy. We have reported on the very high response rates and durable remission rates in patients with ALL. We have treated more than 300 patients with Tisagenlecleucel in clinical trials, and a lot of that information was used for FDA approval of the therapy. CAR-T cell medicines are breaking commercial ground in a new era of genomic medicine. Autologous CAR-T is extending the lives of patients suffering from incurable diseases. Yet the access to these potential curative medicines is being constrained by their cost and an insurance system trying to come to grips with a new pricing paradigm. So far, this does not appear to be slowing development. For example, bluebird bio (BLUE) exercised its option to co-develop and co-promote bb2121 in the US, as part of their collaboration with Celgene (CELG). Bluebird disclosed they would likely also opt-in for the second product candidate bb21217. These disclosures speak well to program progress. They also beg the question: Would bluebird be better off avoiding the cost of commercializing until Novartis and Gilead have made more progress on pricing and reimbursement? First movers in any market are usually embraced by investors, but it remains unclear if first movers in autologous CAR-T will grow fast enough to avoid being labeled first to disappoint. Disclosure: I am/we are long GILD. I wrote this article myself, and it expresses my own opinions. I am not receiving compensation for it (other than from Seeking Alpha). I have no business relationship with any company whose stock is mentioned in this article.